So school is out as of 12:30 yesterday. Whew! I'm finding out more and more that I'm an all or nothing type of personality, and even though I tried my darnedest, I really did sign up to volunteer/help/do too many things that all culminated into the past 6 weeks of utter and total busy bee behavior. I have 10 weeks until school starts again for my now preschooler (!) and first grader (!!!) to plan what I want to do next year and how to save time for myself to do things I enjoy doing also. Meanwhile, I hadn't crocheted for almost 2 months, and while I was selling fundraising t-shirts at the kindergarten registration and assessments last week I was able to make 2 heads! Yay me :) Seriously, you wouldn't think this any major accomplishment, but I'm thrilled. 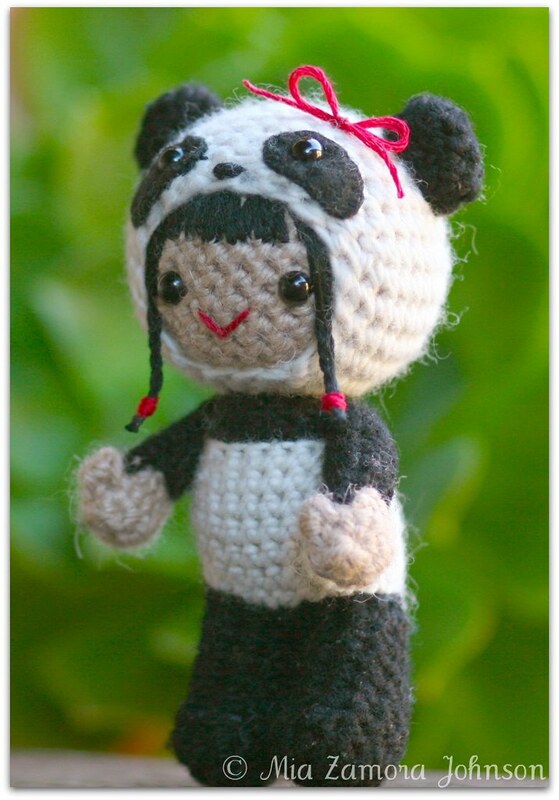 So, I'm just having my panda pattern tech edited and I should be releasing it next week. I know, I'm so sorry it's taken this long. Especially since I talked about it such a long time ago! In other news, I finally figured out how to do a page for Owlishly on facebook. After much vacillating, I've decided to keep my MiaZamoraJohnson account for just family, and old and new friends, that way I can share personal information more comfortably with those that know me in real life and I don't have to worry about people taking things in ways that I don't mean them. But now that I've finally made a decision I set up the page and added pictures. Feel free to stop by and check it out, I'm embarrassed that I keep saying that I'll update things with more frequency, but I do really intend on trying to, and hopefully it'll be something that I can get done now that I have just summer time activities to participate in. 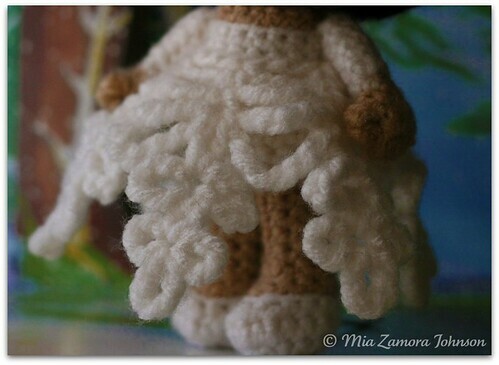 Zoe in a snowflake dress amigurumi pattern available & a giveaway! She's already at my parent's house right now, so I can't get her exact measurement, but she's a bigger girl, so I think she's at least 7 inches tall. I missed the Rebekah snowflake girl pattern, so I wanted to create another pattern that complimented it, without being too similar. I changed the foot design slightly from how I normally do the feet too. I think I actually like it better. 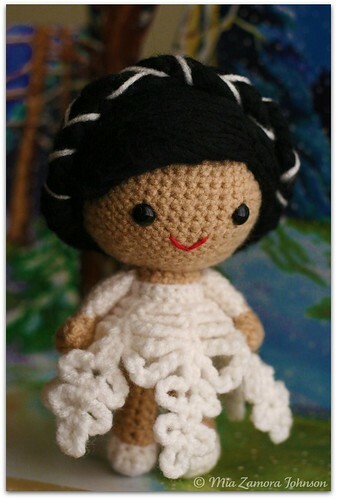 I ended up using the same yarn to make this one as the yarn that I was sent from Crochet Today! to make the Rebekah prototype for the magazine. 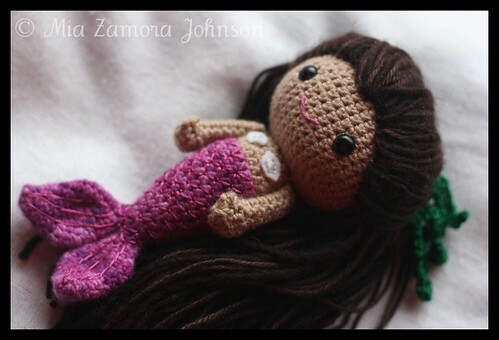 It's not my favorite to work with, but I can understand how so many people like using it for their dolls. Perhaps if acrylic yarn didn't burn my hands so much, I might work with it more often, but I really like wool, so I'm not so sure. The pattern is 6 pages long, with 9 images. I didn't take as many pictures of the making process as I usually do, but I think the one's included will be helpful nevertheless. 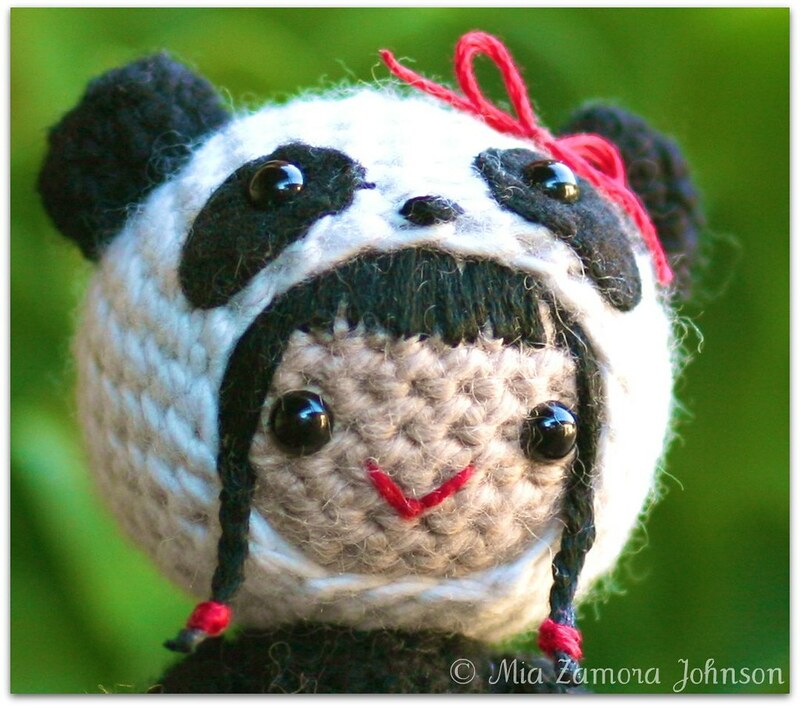 I did have to end up using Lion Brand Alpine Wool for the embroidered/braided part of the hair. I don't know where the heck the black Red Heart yarn had gone (though I'm pretty sure I donated it with a bunch of yarn I gave away), and the only other yarns I had that were black were 2 hanks of Malabrigo silk/wool blend, and the Alpine wool which is a bulky weight, but I didn't crochet anything with it, only used it to embroider the hair to the wig cap that I'd already made in Red Heart. 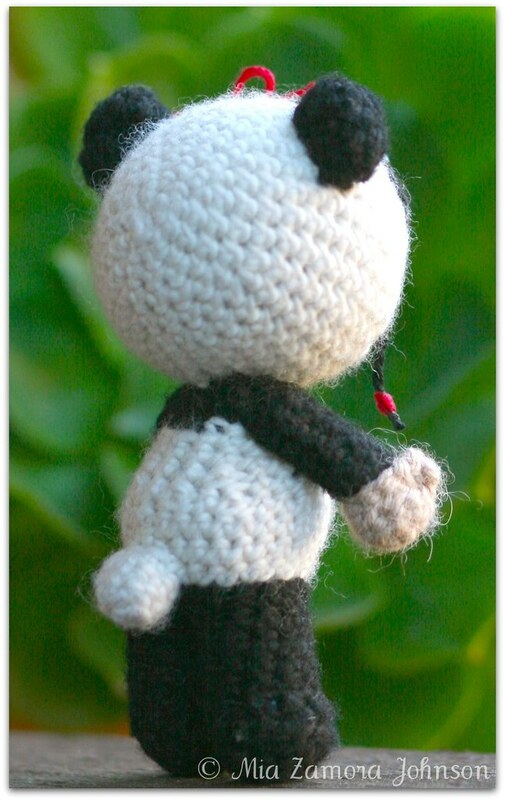 Anyhoo, to enter the contest, all you have to do to enter to win a free Zoe pattern is leave a comment and tell me- What was your favorite pet? And if you want to tell me why, that's always more fun. Only one comment counts per person, and no comments will be entered after noon PST January 4, 2010. Well, it's better late than never... right? 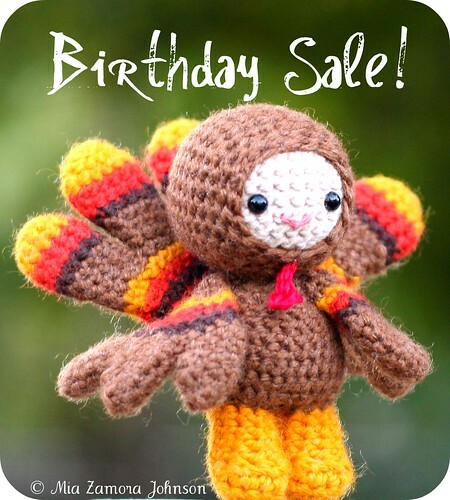 Since my birthday is November 29th, the Etsy sale will be- Spend $10 or more, and get 29% off your entire purchase- Just type in Birthday in the note to seller to get the discount! The sale will run from now until 11:59pm PST November 28th, 2009, since we're leaving the morning of November 29th to camp at the beach for a week, and my shop will be closed while I'm away. Today my in-laws leave, and I'll have a tiny breather before having to get into Thanksgiving mode so I hope to have a little time to get some pattern work done. 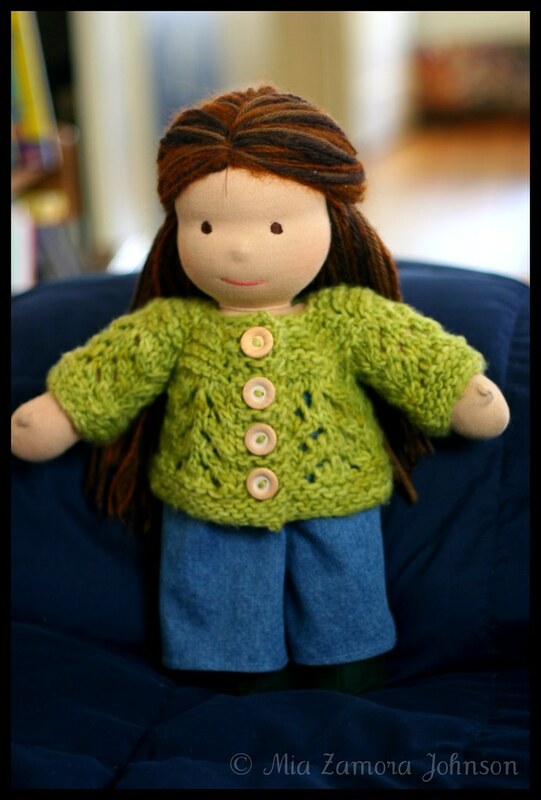 I'm trying to keep Christmas simple, so I'm making a waldorf doll for my daughter (fingers crossed!) and a spiderweb blanket for my little boy, since he is constantly caught using my little girl's flower blanket as a spider web that he catches things in. He likes spiderman a lot, but he likes actual spiders even more, so it's going to be black with white details. 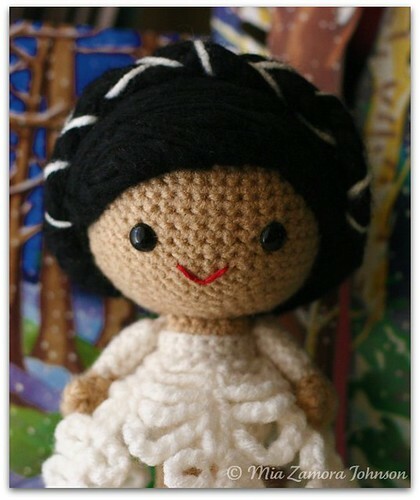 If I have time I'm going to make a doll for my niece too, but with as busy as we ware lately, I can't make any promises! Oh, and another thing- I made the Pioneer Woman's sweet potato dish for the Thanksgiving fiesta at my son's school last Friday- it's a keeper! I usually make sweet potatoes with a tiny bit of butter and brown sugar, but I thought I needed to up the ante for his kinder class since all last week I kept hearing how gross sweet potatoes were from a lot of the kids in the class. I'm happy to report that all except 2 kids gobbled it up, but I think it had a lot less to do with my cooking skills as it did with all the sugar in the recipe :) Nevertheless, it's going to be my contribution to our family Thanksgiving dinner this year! So, that's it for now, hopefully this post wasn't too all over the place, and if I'm not here before- Have a Happy Thanksgiving! 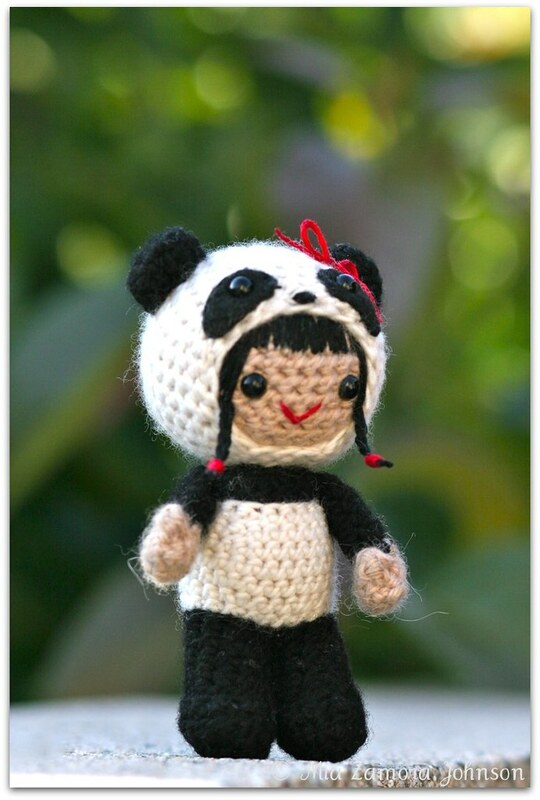 So, I'd signed up for an Artfire account last spring, and then never put any patterns in the shop over there. I thought I'd try it out, but maybe I'm just used to Etsy's format because I don't think it's as easy to find the patterns over at Artfire. Anyway, maybe there's just a learning curve that I've yet to master. But in effort to kick things off there, I'm having a better deal than the one I'm going to offer on Etsy- you can use the coupon code OCTOBER DEAL to get 20% Off on orders that totals above $18.00 in my Artfire studio. 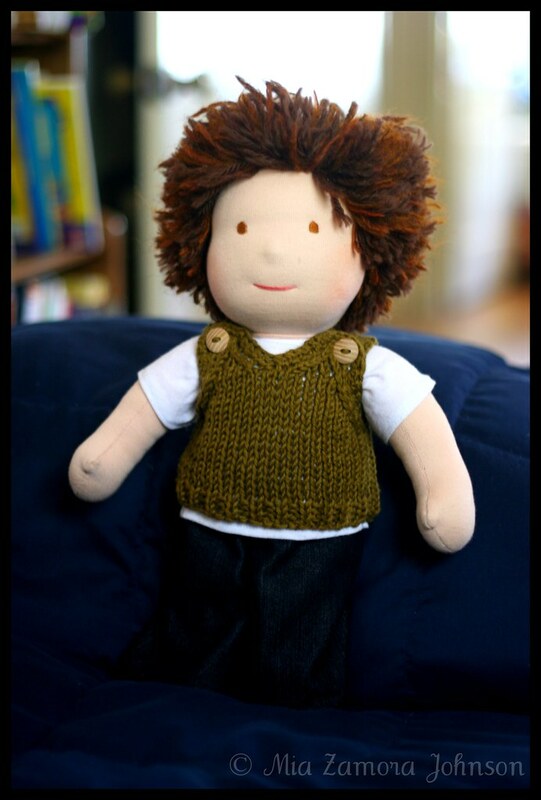 In addition to that, the first 10 sales made will get an free Chester the turkey boy pattern thrown in. This sale will end at 11:59pm October 31st. In my Etsy shop, if you enter the OCTOBER DEAL in the note to seller section, I'll refund 15% of the purchase price on orders that total above $18.00. This sale too ends at 11:59pm October 31st. 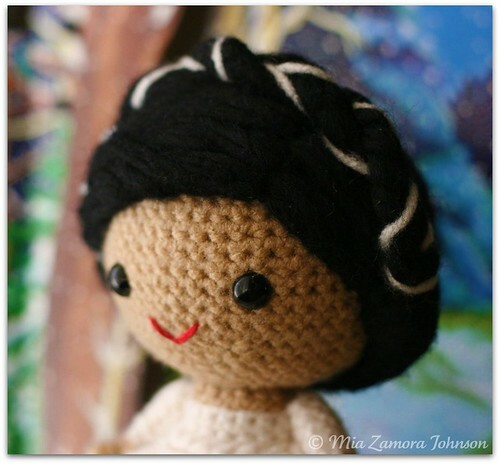 I was asked to make another Mere doll that looked like the one I did for Plush You! so this was the result. 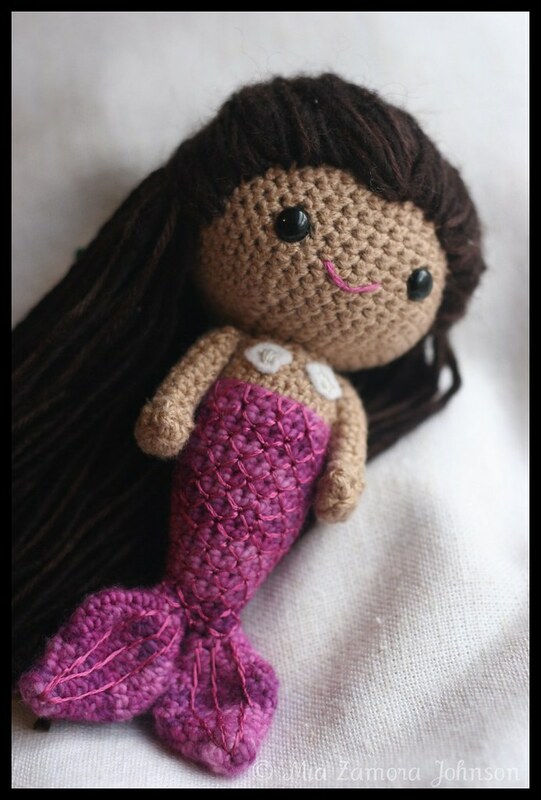 I think now you can sort of see it seaweed that I did to tie the hair back, since the red sea star didn't go so well with the colors of the tail. I modified the tail a tiny bit, but not very much. I don't know if it's noticeable, but otherwise, everything else about her is the same. I did use a yarn needle when I embroidered the fly stitch scales on the tail and it was so much smoother than when I used an embroidery needle, probably due to the blunt tip.